Hi I have a perky little card today using an old favourite from the Visible Image music stamp range. I love this stamp set and its my go to set when making a card for a male recipient. 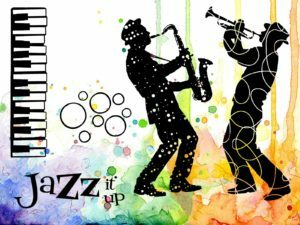 First create an inky background – colours and medium of your choice. If water based ink, spray with fixative before adding the next layer . Then take torn pieces of printed rice or tissue paper. (I used music themed) but you could also use news print or washi tape. I adhered the rice paper using matt medium. When dry, stamp the main image in black along with the small circle stamp. Then using a paint lid with a slightly wider circumference, dip in white paint and print on to the card. The art work was mounted on to complimentary card stock and the white dots on the main image highlighted with a white gel pen. I also added a shadow and line under the figure using a black Stabilo pencil. Love the vibrant purple and gorgeous texture! Facebook group show us your Visible Image makes, join in with the banter, and enter our monthly challenge! We will be back a little later with more fantastic inspiration, including some of the first projects created with our NEW stamps and stencils! Hi there! Hope you are having a great weekend. and welcome to my DT post for Visible Image. Today I have used the fab new stencil ‘Grungy Union Jack’ and some of the music themed stamps to made two cards. For the first one I used the good old Distress Inks, a blending tool, water and the new stencil. Doesn’t that look fabulous ! I stamped the words Bold and Beautiful on either side and then put the singer in the middle of the two words. I used a stamping tool for this. 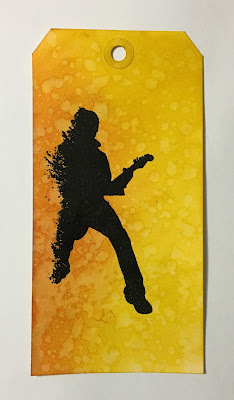 This one was made with Distress Oxide inks, a blending tool and water. I stamped the words and the musician on it using my stamping tool. I then matted the panel on a piece of pattern paper and on a card. Great inspiration Corrie! Thank you ♡ The flag stencil looks awesome in so many colours! Thanks for visiting our blog today, we’ll be back with more gorgeous inspiration a little later including a fantastic tutorial video from Veerle Moreels. Good Evening! We have 2 fantastic cards to share with you today both featuring our brilliant new Strobes stencil.. which is now back in stock! This is a card I created with Visible Image’s fabulous ‘Sing’ stamp set and amazing ‘Strobes’ stencil. I won’t lie – it took time to get the colours laid down but I knew it could look good, so I selected some bright distress inks, taped my stencil over my card and cut some thin strips of cut-and-dry foam. The result was this funky background, which, combined with a little bit of words and music, created a base onto which to mount my singer. I stamped my singer onto white card and embossed her with black powder. I also coloured her dress in a little with Nuvo Glitter Markers before trimming round and mounting the image onto the base card. A few sequins to finish and the card was complete! It’s time for me to share something I’ve created, using some of the awesome Visible Image goodies available. Again it’s a card for a man, people say that men are very hard to create for, but Visible Image have that covered, with some fantastic Stamp sets, and also some new stencils. I took a square piece of white card, placed the Union Jack stencil on it, and blended through it, using three Oxide inks, Picked Raspberry, Salty Ocean and Twisted Citron, after removing the stencil, I spritzed it with water, and let it run. Then after drying it, I placed on the second stencil, with the middle of it at the top of the card, and the strobes radiating down, and blended through it with Salty Ocean. 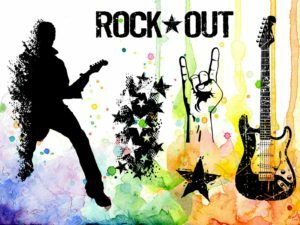 When it was dry, I stamped the Drummer, and the Rock Out with Versamark, and heat embossed the drummer using Black Embossing Powder, and the Rock Out with white powder. 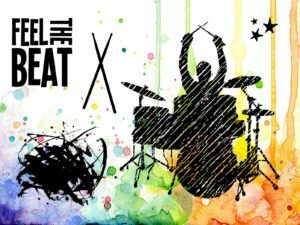 I grounded the drummer, by adding a darker band underneath him. Using the devils horn hand, from ‘Rock Out’, I stamped with Seedless Preserve Oxide ink, and gently coloured them in in the same colour. 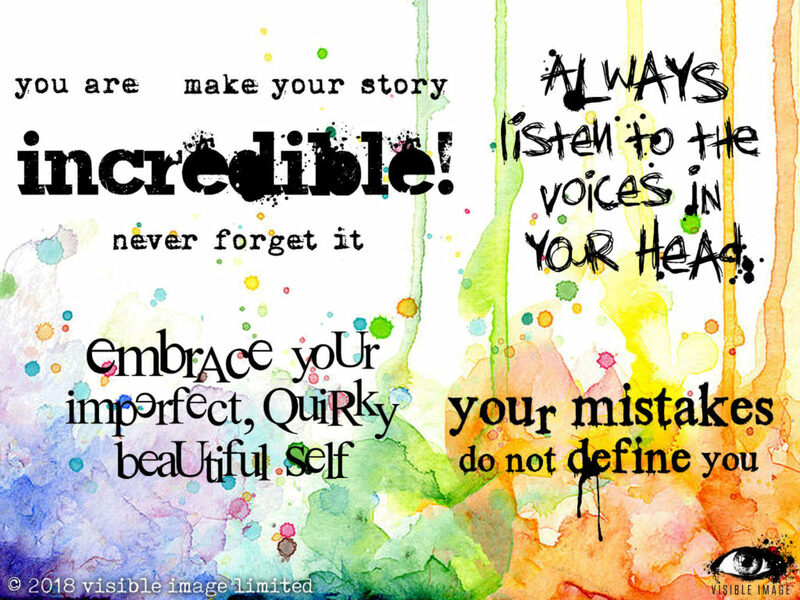 We hope you have enjoyed tonight’s double inspiration! We have lots more to share with you here on the blog tomorrow! The Visible Image Facebook group challenge theme this month is “Distressed” so I made a vintage style card. I hope it gives you inspiration to play along in the challenge! 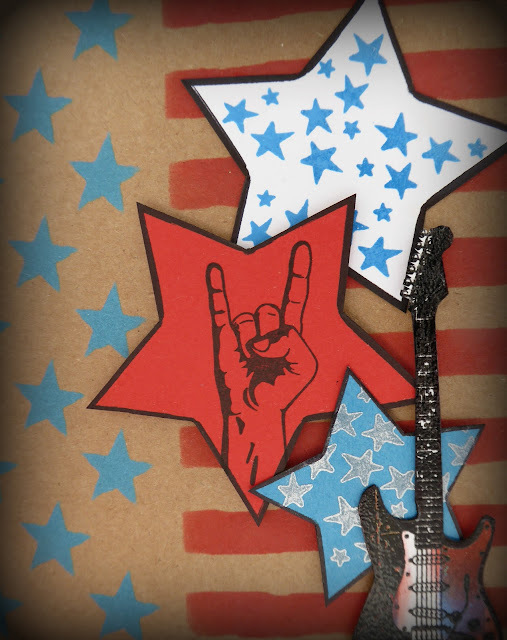 On a piece of kraft card stock I stamped the stars. I used Archival ink in the colour Potting Soil; I used the same ink to ink the edges and added some black Archival over the top later. I then distressed the edges. The guitar was stamped on book pages and torn out. The edges were inked with the same brown ink. I added the word ‘Music’ and coloured in the letters on the guitar with a blue coloured pencil. Lastly I matted the panel on a black card. Thanks for visiting our blog today, we’ll be back with gorgeous inspiration from Teresa Morgan tomorrow. 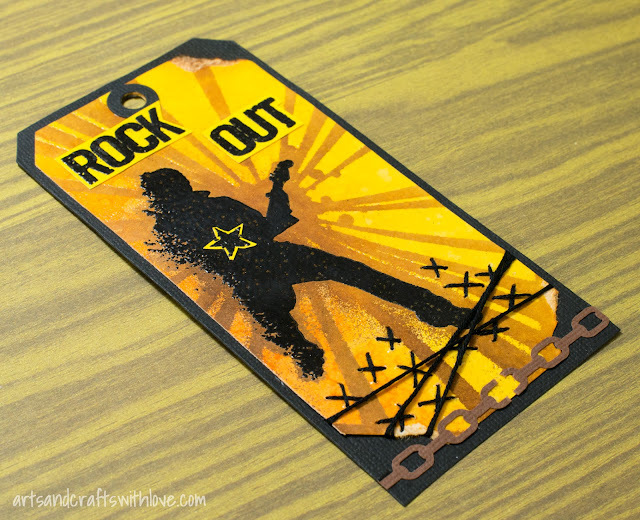 I’m sharing a card I made with one of my favourite ever Visible Image stamps.. the amazing ‘Rock Out’, and the brand new ‘Stars and Stripes’ stencil which is also up there at the top of my list too! For this card I stepped away from the bright colours and went for three natural Distress Oxides – Antique Linen, Frayed Burlap and Iced Spruce. Firstly I made a pale inky background onto Daler Rowney mixed media paper, just smooshing and picking up bits of ink which I had applied to a glass mat and spritzed. I love the fact that at this point you have a piece of soggy card that really looks like it should go in the bin! Only crafters get it…. I helped this to dry with my heat gun, then taped my stencil over the cardstock. Iced Spruce through the stars, Frayed Burlap through the stripes BUT I pretty much avoided the middle, I sponged down from the top of each stripe and up from the bottom, achieving (I am going to confess, I didn’t realise how good it was going to look, I just thought I’d try it) that bright shine across the whole of the stripes. I love the illusion that I have used colour to lighten that area, when in fact I used NOTHING! From that point it was easy and exciting to finish the card. I stamped my rocking guitarist in Versafine Onyx Black, added a couple of stars either side of him and the ‘Rock Out’ words across the stripes in Iced Spruce. A touch of black fine liner to make the grey stars pop and this was complete. I found some corrugated card that had waited 12 years in my cupboard to be used, and the card was finished! You might have seen this one on Create and Craft at the weekend, it’s one of my show samples, but I’m sure you will agree, the whole Design Team never ceases to astonish. I LOVE Visible Image shows, Mark and Pauline are incredible with their designs and demonstrations. You can always catch up with the Create and Craft shows for 7 days, but remember that you can order directly from Visible Image or your favourite local or online retailer too, and be quick, those new stencils are going to fly out of the door!!! We will be back later today with a gorgeous card from Jane Tyrrell, featuring another of our NEW stencils! Thanks so much for stopping by our blog today. Make sure you tune in or set your recorder for the shows, as Mark and Pauline have some great demos planned! 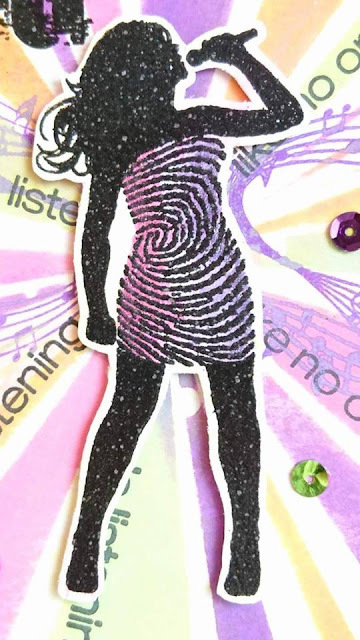 We will be back later with awesome inspiration from Teresa Morgan featuring another of our NEW stencils! It’s Fabulous Friday again, and time for me to share some ‘Visible Image’ Love. 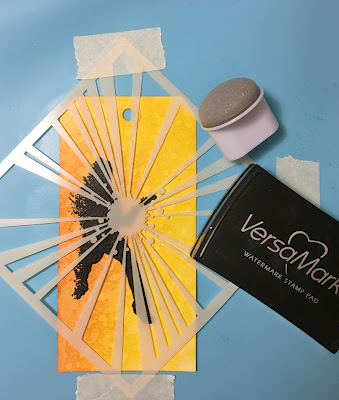 I was so excited to receive some of the awesome new Visible Image stencils to play with, it will give an awesome new dimension to the already fantastic Visible Image stamp designs, well done Mark Alexander (designer extraordinaire). The background of this card was created using Brushos. I sprinkled yellow and red Brusho’s onto the card, spritzed it with water, and added more Brusho to get a nice intense colour. After drying it, I then used the stencil: I went over the whole card with Festive Berries Distress Ink, using a blending tool, this gave a nice ‘hot’ feeling. I stamped the microphone using Oxide ink, but it sort of disappeared into the background, again I dried it all. I then stamped the beautiful singer using Versamark, and heat embossed her with Black Glint embossing powder, I also did the same with the SING sentiment. I felt the new ‘Disguise of a Smile’ sentiment went quite well with this image, and I heat embossed it with white powder. To finish off, using a quickie glue pen, and glitter, I gave her a sparkly dress. Mark and I are back on Create & Craft TV next Friday 8th September at 7pm, and again on Saturday 9th September at 9am. we will be demoing some of the fabulous new Visible Image products. Thank you Pauline ♡ This quote does work so well with our singer. Want the chance to WIN a coupon to spend on our NEW stamps or stencils??? Just enter anything you create with our stamps this month into our ‘Show & Tell’ album over in our Facebook group or join in with our themed challenge there too… this month’s theme is ‘distressed’. We will be back with awesome new inspiration from Nicky Gilburt tomorrow.